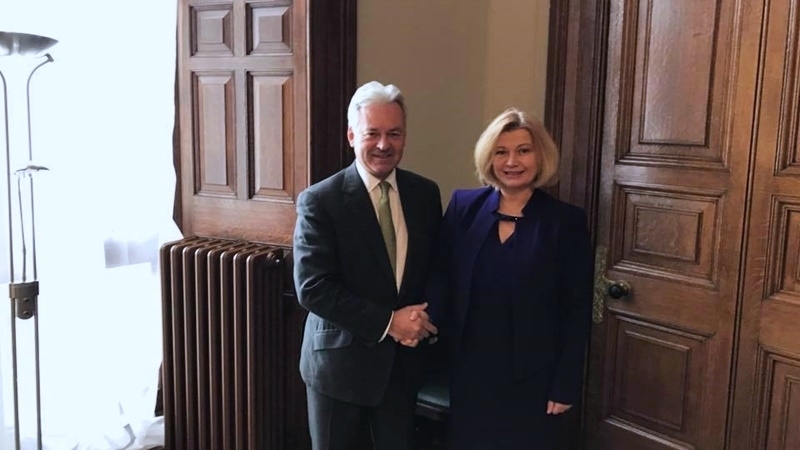 Iryna Herashchenko, First Vice-Speaker of the Verkhovna Rada of Ukraine urged the UK to facilitate the liberation of political prisoners. “Contacted with Alan Duncan, Minister of Great Britain for European and American Affairs at Foreign Office today. We discussed the security issue on the Donbas, human rights violations in the occupied Crimea. Urged the UK to assist in the release of the hostages as well as to deploy and integrate necessary mechanisms, mediation efforts,” Herashchenko stated on her Facebook page. They also considered the issue of the peacekeeping mission on the Donbas, she noted. “It is good that the British government understands the nuances and differences between the mandate of the present peacekeeping mission and Moscow's hybrid proposal aimed at freezing the conflict. UK actively supports humanitarian mine clearance projects on the Donbas," Herashchenko noted. According to her, the issue of waving the visa regime between Ukraine and Great Britain was discussed as well. Earlier, Iryna Herashchenko stated that release of the Deputy Heads of the Mejlis of Crimean Tatar People Akhtem Chiygoz and Ilmi Umerov was a known fact among the informed ones a couple weeks in advance.